Thanks to Maggie Seeley and Mark Juedeman for this story! 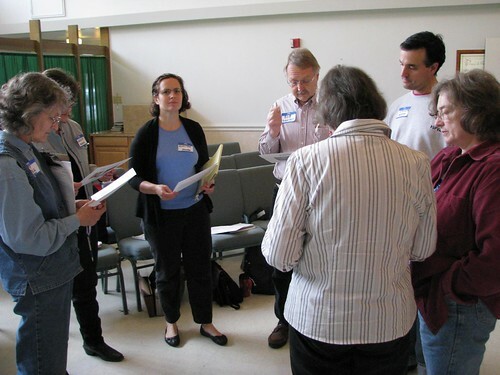 A recent Training for Transition (T4T) in Houston, February 19-20 2011, revealed a community of citizens who were well connected, well organized and who meet each other monthly at Hub meetings and pot-luck dinners to reinforce their interest in each other and Transition projects. During the last year five Permablitzes have been staged, allowing Houston members to share in the creativity of building resilience in each other's yards and learning Permaculture principles. Members from the mulling Transition Dallas Initiative and the official Transition Austin Initiative also attended the Training, and brought fresh perspectives and excellent ideas with them. The Transition Training weekend activities began on Thursday evening, February 17, with a showing of “In Transition” at St. Thomas University. Almost 50 people were in attendance and joined in a post-screening panel discussion with Steve Stelzer from the City of Houston Green Resource Building Center, Lisa Slappey, professor at Rice University, and Transition Trainers David Johnson (Portland, OR) and Maggie Seeley (Albuquerque, NM). Two ends of the local resilience spectrum were explored during tours of an urban homestead and a community garden for T4T participants on Friday, February 18. 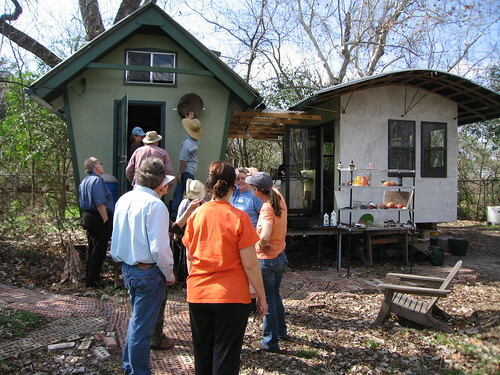 The first stop was a city lot where a Houston couple have built two tiny houses and are living completely disconnected from city services by employing natural ventilation strategies, solar PV electricity, rainwater harvesting, solar cooking, and vermicomposting. They also have extensive organic fruit and vegetable gardens, have built a vertical-axis wind turbine to pump water from a shallow well they drilled themselves, and are experimenting with biochar using a pyrolosis chamber of their own design. The Westbury Community Garden was the second stop on the tour, where a discussion of the history and development of this recently-established community garden (serving both homeowners and apartment dwellers) was provided by Becky Edmonson and Transition Houston member Colleen O'Brien. The garden is unique in both the level of support it has received from the local community and the diversity (racial and socioeconomic) of the gardeners. After the tour was concluded many of the course participants joined in a kick-off potluck to meet each other, the Transition Trainers, and some of the people behind the scenes in organizing the T4T. 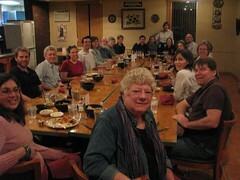 The potluck also provided an opportunity for out-of-town participants to meet their hosts. Four participants from Dallas--Anita, JuLane, Kathryn, and Steve, and John from Austin were housed in homes of Houston Transition families. Car pooling to the training sites was also organized by participants and the training planners. The Transition Training started on Saturday by having participants stand along a continuum: Novice/Beginner at one end and Veteran at the other. When questioned individually, participants revealed other expertise, and also concerns which were shared by others. Community cohesion was very high. Five Houston Transition members (Charmaine, Marybeth, Nancy, Quealy, and Shawn) prepared and served breakfast and lunch each day for the class and then cleaned up afterward. Eggs, strawberries and bread were donated by farmers and bakers at the Urban Harvest Farmer’s Market. Local grapefruit from the backyard of a host family was passed out when people finished their course evaluations. It was a strategy that responded to basic human needs: great food, some of which was locally grown; shelter with like-minded community members, a pot luck dinner to get people comfortable and grounded after traveling; car pooling to reduce CO2 and guarantee timely arrivals; and the personal touch and organization of the Houston planning team to insure that logistics were covered and the individual needs of the participants met. Two quite different venues were used. The Houston Mennonite Church was homey, had plenty of space and a good kitchen, and was located in an early post war ring suburb of Houston. The Herman Miller showroom, the Sunday morning site, was sleek and high tech, and located in the high-end retail Galleria District. What an interesting and contrasting combination of meeting spaces! "It was well-organized and inspiring. I don't know how the trainers were able to pack so much into two days, but the skilled group processing worked wonders. The quality and timing of the video presentations was perfect. The setting was comfortable. The food was abundant and delicious. We have arrived back here "on the ground" feeling full of abundant resources to develop around us. 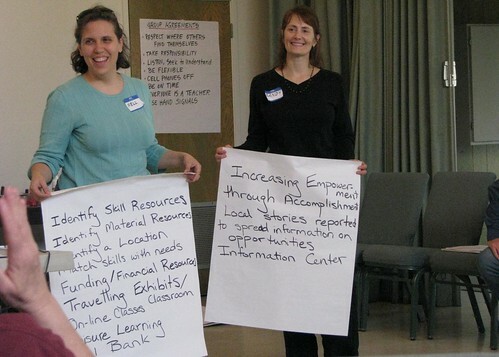 We brainstormed about the available resources at our home base while we were at T4T and were amazed. We are setting up the first steps to introduce our new attendees to the vocabulary and concepts of Transition. We feel confident." Twenty eight participants stayed engaged for two days, and found it difficult to leave each other. Class participants Aaron, Alejandra, Anita, Bob, Elliott, Jennifer, John (from Austin), John (from Houston), Judith, JuLane, Kathryn, Keith, Larry, Leslie, Marilyn, Mary Caroll, Nancy, Neal, Nell, Pampi, Robin, Sandy, Sarah, Stephanie, Stephen, Steve, Theresa, and Victoria exchanged contact information and intend to stay in touch and provide mutual support for each other's Initiatives. In course evaluations, there was a high appreciation of Open Space and Talks with the Ancestors. David Johnson and Maggie Seeley both agreed that the group and the training were exceptional. Hooray for Houston, and Dallas and Austin. Transition is active and vibrant in Texas!